Solar is going big. Again. The federal government on Monday green-lit a 485-megawatt solar plant that would generate enough carbon-free electricity to power 180,000 homes when it comes online in the Southern California desert. government-owned land, a cornerstone of the Obama administration’s efforts to fight climate change. That land, however, often turned out to be home to desert tortoises, blunt-nosed leopard lizards, and other endangered wildlife. Many of those projects went belly-up in partbecause of fierce opposition from environmental groups. That prompted an effort by the federal government to be “smart from the start” about where it allowed big renewable energy plants to be built. So the Blythe Mesa Solar Project, which was approved Monday, will deploy tens of thousands of solar panels across 3,587 acres of already disturbed or fallow farmland where wheat, alfalfa, and citrus had been grown. No desert tortoises will be harmed. That won Blythe the support of Defenders of Wildlife, the Sierra Club, the Wilderness Society, and other big environmental groups that previously opposed other solar power plant projects. “Due to the previously disturbed condition of nearly all the land proposed for the project, numerous environmental organizations supported the project because it conformed with our recommended criteria for siting large-scale projects in the California desert,” Jeff Aardahl, California representative for Defenders of Wildlife, said in an email. The project’s developer, Renewable Resources Group, is a Los Angeles company that invests in green energy and agriculture. “We specialize in developing utility-scale solar…projects on previously disturbed private land,” Tom Eisenhauer, a spokesperson for the firm, said in an email. Communities that find such gargantuan renewable energy projects in their midst also are getting smarter. Riverside County last year imposed a $150-per-acre annual fee on solar power plants and will collect nearly $500,000 a year from the Blythe project. 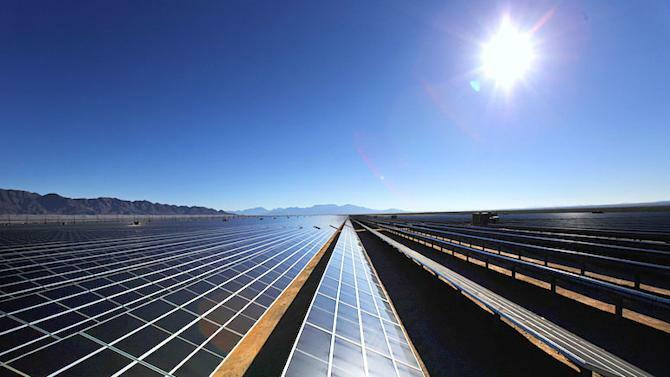 That the Blythe project is moving forward is also a sign that solar energy is becoming increasingly competitive with fossil fuels. Earlier huge solar power plants had only been commercially viable thanks to a 30 percent federal tax credit. That incentive is set to fall to 10 percent at the end of 2016, meaning the Renewable Resources Group likely thinks it can make money without the government largesse. Hurdles remain. The company must still sign a long-term power purchase agreement with a utility that wants to buy the electricity generated by the project. If the California legislature passes a pending bill requiring the state to obtain half its electricity from renewable sources by 2030, there will likely be no shortage of buyers of solar energy. “We don’t discuss PPA status, but we’re planning for commercial operation in the next few years—and we feel good about that,” said Eisenhauer. Aardahl said the battle to generate clean, green energy while protecting desert wildlife continues despite the approval of projects like Blythe.